The brain is constantly abuzz with electrical signals transferring information between brain cells. The results of this intense electrical activity are the perceptions, thoughts, ideas, decisions, emotions, and movements that constitute human life. Deciphering the code that these cells use is one of the dominant challenges facing neuroscientists. Cracking the brain’s code—and discovering how neurons compute and transmit information–is the focus of the Neural Code Laboratory at ELSC. The Neural Code Laboratory is being directed by Dr. Michael (Mickey) London, who joined ELSC as a Senior Lecturer. The remarkable young Hebrew University alumnus earned his B.S. and Ph.D. at the university, completing his doctorate under the supervision of Professor Idan Segev at the Interdisciplinary Center for Neural Computation, which has become a vital part of ELSC. Dr. London conducted his post-doctoral work at University College, London (2002-2010), first as a Human Frontiers post doctoral fellow, and subsequently as an MRC senior research fellow and a Wellcome Trust research fellow. Working in the laboratory of Professor Michael Hausser, Dr. London refined his multi-disciplinary approach, focusing on the neural code and single neuron computation. Combining expertise in theory with cutting-edge practical skills, Dr. London has developed methodologies helpful to investigating how single neurons process information and communicate. His research, published in Nature (July 2010), is transforming scientific understanding of the impact of the activity of individual neurons on the larger neuron population. Dr. London has demonstrated that even the addition of a single electrical spike to one neuron can produce a significant effect on brain activity. This original and unexpected finding has led scientists to reexamine long-held assumptions about how information is coded and translated into behavior. Dr. London plans to study the effects of modifying signals while observing their behavior. This type of research was unimaginable before recent technological advances in optogenetics and two-photon imaging. 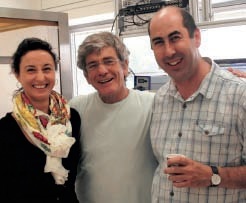 A $ 400,000 two-photon microscope at Hebrew University is advancing these efforts: this microscope enables scientists to examine a live specimen and image living tissue up to a very high depth of about one millimeter. Thus scientists can image brain activity as it taking place—and without hurting laboratory animals. Dr. London’s goal is to image activity in a local neural network, identify and record the activity of an individual neuron that is participating in a specific computation, and manipulate activity in that single neuron, assessing its impact on coding and behavior.